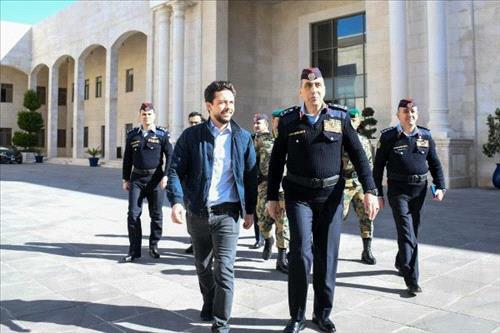 AMMONNEWS - His Royal Highness Crown Prince Al Hussein bin Abdullah II on Monday expressed appreciation for Public Security Directorate (PSD) personnel’s role in professionally serving citizens and maintaining the nation’s security. During a visit to the PSD and a meeting with its director, Maj. Gen. Fadel Hmoud, and a number of its officers and personnel, Crown Prince Al Hussein commended the PSD’s professionalism in serving citizens and visitors. His Royal Highness expressed confidence in PSD personnel’s abilities and readiness. The Crown Prince was briefed on the achievements of the PSD’s units in 2018, and measures taken to fight crime and ensure road safety, as well as steps taken as part of the directorate’s development strategy to enhance performance. His Royal Highness also spoke to a number of PSD personnel attending the meeting, who highlighted their duties and how the latest technology is utilised in the PSD’s operations to ensure maximum efficiency.